Hybrid Camera Revolution: Goodbye Frankenrigs! Hello Sony NEX-EA50! The specs look like Sony engineers and marketeers have been reading my mind. Shoulder mount large-sensor camcorder with high resolution 16MP stills (with RAW). 1080/60p. Built-in XLR inputs with full manual audio level control and pro quality sound. A top handle. A real power zoom with a rocker instead of Panasonic's stupid ring. As anyone who reads my posts on this blog and elsewhere knows, I am a big fan of Panasonic's GH1 and GH2 cameras (I own both). And I've been looking forward to the rollout of the GH3, rumored to be next month at Photokina in Berlin. But, even without seeing a whole range of images from this camera, if it only matches the image quality of the VG20 (which I have some experience with) this new entry from Sony steals a lot of Panasonic's thunder. 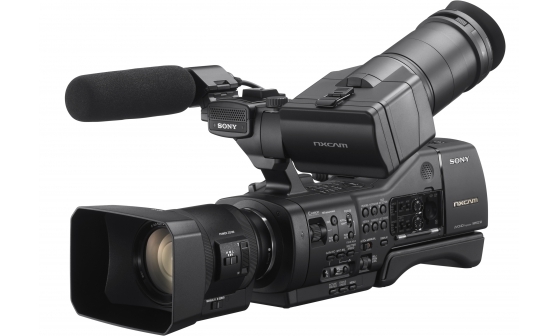 The Panasonic GH3 is unlikely to have XLR inputs or a shoulder mount - so shooters will still have to buy shoulder rigs and external recorders, closing the price gap with this new camera. If the GH3 is introduced at the $1000-$1200 body only price point (comparable to the OM-D EM-5 and NEX-7), shooters would have to add a $300 power zoom lens, a $170 XLR capable external recorder, a $220 XLR boom mic and a $1000 Redrock shoulder rig to make it as functional as a straight-out-of-the-box EA50. And if the GH3 doesn't have a headphone jack and 1080/60p, it is going to lose a lot of sales to this camera - perhaps including mine. Worse for Panasonic - at the ~$4000 price point, the EA50 arguably has better video camera ergonomics than the AF100 - with the addition of the still camera chops that the AF100 lacks (it is even a better still camera than the $8000 8MP capable Sony FD700!). No, it doesn't have the AF100's built-in ND filter or HD-SDI-out, but a $30 variable ND filter and a $180 HDMI to SDI converter will fix that for significantly less than adding the cost of a shoulder rig and separate still camera to the price of the AF100. This camera really hits a sweet spot for shooters who want to upgrade from a DSL camera to a hybrid still/video camcorder with built-in XLRs - but aren't that excited about bringing their shoulder rigs along with them - and don't want to pay $8000 for the still/video capable FS700. And for those thinking about the FS100, who want a shoulder mount and the ability to shoot high quality stills - and who want to pay about $1000 less for a camera with the 18-200 lens included - it might be worth giving up a little sensor size and image quality (Andrew Reid at eoshd disagrees with me ;)). I think Sony's going to sell a lot of these. Good analysis. I have the ea50 and so far, it looks pretty good. The sleeper in this camera is the lossless digital zoom as it works both with primes and zooms, thus effectively doubling the zoom of any lens one may have without image degradation. When coupled with primes like old Nikkors and Zeiss, the imagery's not only astounding but versatile because one can now frame shots using fast lens with optimal clarity. Owning a VG 20 has given me a great appreciation for image quality, both in stills and video, something the ea 50 should deliver without issue. IMHO, Sony has a winner here.